Observing life from a state of detachment is not the same as ignoring the life going on around you. It’s not apathy. And it isn’t a state of resignation. Ignorance, apathy and resignation are mindstates. Through meditation techniques, such as observing, you can transform these unproductive mindstates. And mindfully allow new mindstates to help form part of a new, natural outcome. How? By any of a number of ways. 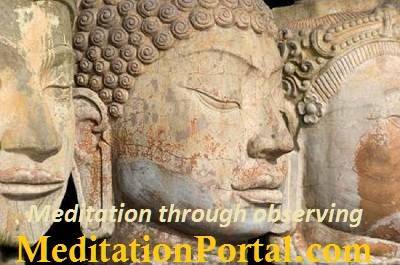 One is by cultivating a habit of daily meditation. You condition your mind to be still, to really listen to silence during your meditation session. You begin to see things differently. You realize you have the freedom to prioritize events or things and their importance. The very things that were once difficult to sort through but hidden or even denied come to light. It can also result in providing new insight. For example, you might emerge from meditation and come up with an idea about how to meet difficult situations. With a solution that could work things out well for you and any others concerned. One meditation technique might be to pose a question before meditation, and then let it go. And find, through insight, that the mind takes you back to the point from where you began the meditation. But you emerge with a fresh new awareness, a new attitude. Try it and see. If you’re looking for more meditation techniques, I recommend this highly rated book, The Best Meditations on the Planet: 100 Techniques to Beat Stress, Improve Health, and Create Happiness-In Just Minutes A Day (Most Effective). Just go look inside, it’s filled with great meditation techniques.